Through the nature of my business, I have met and created websites for many artists throughout the years... I met James N. Muir 13 years ago when he was working on the commissioned 12 foot Maricopa County Sheriff's Memorial "They Served Well" which now stands in downtown Phoenix. 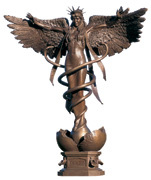 He had just completed the 12 foot Angel of Healing and Peace, "Caduceus" which is located at both Scottsdale Hospitals in Phoenix and Scottsdale. I ultimately was hired to set up his web site and have had the opportunity to learn first hand his tireless effort and integrity, and the degree to which he has striven to use his talent to create good art, address social issues, and uplift society in what he terms as Allegorical Art. I found it interesting the term he chose to use and grew to understand why, it certainly describes his work and the sincerity of this artist. In getting to know this man, his philosophy, his desire to inspire, along with his dedication, gave me a deeper appreciation for art, the messages they can convey, and the impact art does have on humanity around the world. 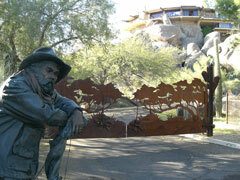 Muir has been a professional sculptor for almost 30 years and is collected both nationally and internationally. I would like to submit his work for your review and consideration for the Governor's Art Award. I believe he and his work are deserving of this opportunity of recognition. Having created many life-size and monumental sculptures for public installation throughout the country, his skills and quality of work will hopefully meet your expectation and necessary qualifications to be considered. 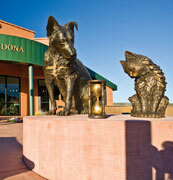 You will find images of his sculpture installations both in Arizona and nationally. This will give you some insight into the quality and depth of James Muir's work, his chosen path in public art, and his philosophy regarding what he terms his "Allegorical Art". James does believe artists can make a difference through their work and your Award can obviously bring attention to good art and the artists who dedicate their talent to create it. By clicking on www.AllegoricalArt.com website you may also view his work. James had a book released in 2004 "Lanterns Along The Path" that addresses the messages that art can bring to many. James was honored that this book was selected for the Pinnacle Achievement Book Award in the Inspirational Category and then chosen by Barnes & Noble to be offered nationally. Should you want a copy of this book, please contact us. 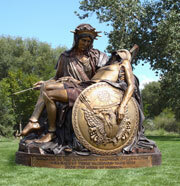 Examples of a few of his sculptures that demonstrate messages to society that you may relate to and reflect the desire for contribution to society are: "Caduceus", "Children", "The American Pieta", "Duty", "Sons of Liberty", "Time", "Walk With Me", "Let Freedom Ring-Lil Liberty", and "Thomas Jefferson". These sculptures, in their individual ways, represent peace, healing, freedom, courage, love, and hope. For more information, you may visit James' website: www.JamesMuir.com . 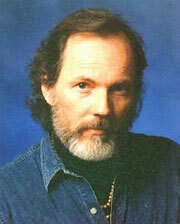 James is a prominent sculptor whose work has always been about the triumph of the human spirit. His work ranges from historical to contemporary. After knowing James Muir for these years, I believe and have come to understand that all of his work created begins with the foundation and desire of good art to the best of his ability and that the allegories/messages contained will uplift society and contribute to humanity in a meaningful way. "Time-Heart of The Hound & Soul of The Cat"